Image: Technicians in ESA's ultra-clean microbiology laboratory, part of ESTEC's Life, Physical Sciences and Microgravity Laboratory, follow strict Planetary Protection procedures as they prepare the COMARS+ temperature sensor to be put into storage until it can be integrated into the heat shield of ExoMars 2016's Schiaparelli lander. This temperature sensor is destined to land on Mars as part of ESA's Schiaparelli module in late 2016. Schiaparelli will hitch a ride to the Red Planet with the ExoMars Trace Gas Orbiter, set for launch on a Russian Proton rocket at the start of 2016. By proving Europe's capability to land safely, the door will be opened for ESA's ExoMars rover two years later. Schiaparelli will also do useful science in its own right during its estimated two to eight martian days of surface life. First, sensors embedded in the heatshield will record details of its plunge through the alien atmosphere. Then, a battery-powered suite of sensors will measure the electrical activity and transparency of the surface atmosphere, its wind speed and direction, along with air pressure and temperature. 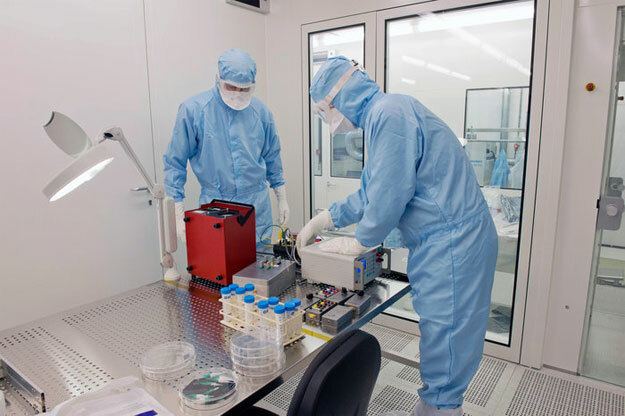 Produced by Germany's DLR space agency with France's CNES space agency, the heatshield temperature sensor package was delivered to ESA's technical centre, ESTEC, in Noordwijk, the Netherlands, earlier this year. It must be stored until it can be integrated into the lander's heatshield, but first the ExoMars team had to be certain the sensor had not picked up any microscopic hitchhikers along the way. Anything headed to Mars is subject to strict 'Planetary Protection' to ensure that the pristine environment is not contaminated by terrestrial microbes, which could mask possible evidence of alien life or result in a false-positive detection of life. ESTEC's cleanroom, part of its Life, Physical Sciences and Microgravity Laboratory, is designed for such demanding work. Its rigorously filtered air contains millions of times fewer particles than the outside atmosphere: fewer than a dozen particles larger than 0.1 micrometres - each equivalent to a single speck of dust - per cubic metre of air. Technicians donned sterile 'bunny suits' before they could have contact with the sensor, entering the 35 sq m cleanroom through an air shower. Like all ExoMars hardware, the sensor was itself built in cleanroom conditions, but the technicians were still required to make 'bioburden' checks, drawing swabs across equipment surfaces that could be then put onto culture plates to identify any contamination. In the event, it gained a clean bill of health, which meant it could then be placed into a sterile, antistatic bag for storage within the lab's protected environment. It joins other Schiaparelli flight equipment already in storage, including the Descent Camera that will record the later stages of landing.